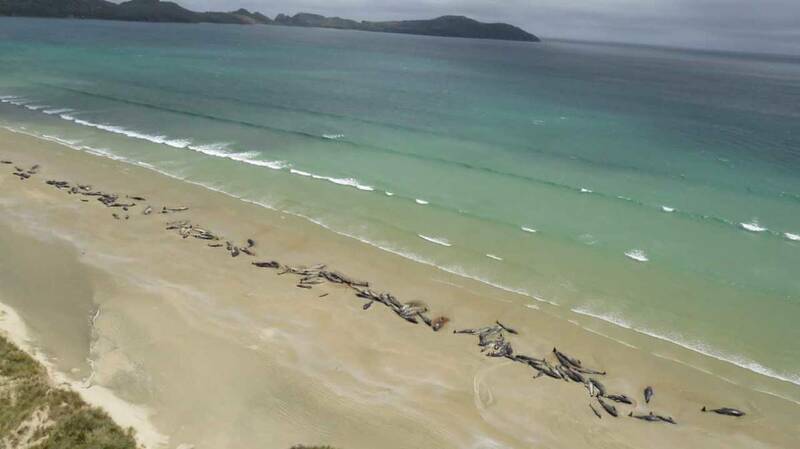 No fewer than 145 pilot whales died after a massive stranding in Mason Bay on Stewart Island. Reportedly, a hiker saw the whales Saturday and reported the Department of Conservation staff at 10.30 pm. Two pods were stranded on the south side of Mason Bay, about 2 km apart. DoC Rakiura operations manager Ren Leppens said that half of the whales had already died by the time they were found and due to the condition of the remaining whales and the remote, difficult-to-access location, it was decided to euthanize the rest. "Unfortunately, the chances of successfully releasing the remaining whales were extremely low: the remote location, lack of staff in the area and the deteriorating state of the whales meant that the most humane thing you could do was euthanize." "However, it is always a heart-rending decision to make." Stranded marine mammals are a relatively common phenomenon on the New Zealand coast, with DoC responding to an average of 85 incidents per year – mostly from individual animals. On Sunday, 10 pygmy squids stranded on Ninety Mile Beach. Two have since passed away and attempts have been made to make the others float again. It was the second stranding in the far north in three days after a 15-meter sperm whale died on the beach of Tokeroa on Saturday after being washed ashore on Friday. It is unlikely that the strandings are related. Do we really have to give red meat the heel?